Oconto, Shawano, and Michigan's Menominee and Dickinson Counties. Spring Rehearsals Start March 25, 2019! Rehearsals of the N.E.W. 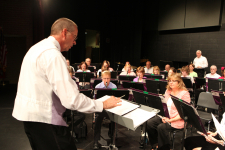 Concert Band are scheduled on Monday evenings from 7:15 pm to 9:00 pm in the Coleman, Wisconsin High School band room. The two band concerts are mid-Spring and mid-Fall. There are six weekly rehearsals on Monday evenings prior to each concert. Each public concert is followed the next evening with a short concert, by a smaller group of the band, at a local nursing or assisted living facility in the area. Contact Karen Kortbein so she can make a folder for you. pick-up points or by mail. Marinette High School for Concert at 3:30 pm.